Treats dandruff and brings vitality & gives strength to the hair. 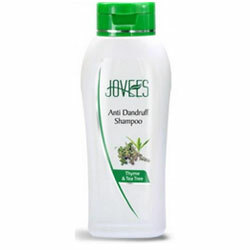 Jovees anti dandruff herbal shampoo has been produced scientifically using precious herbs and botanicals that have proven therapeutic properties to treat dandruff and brings vitality & gives strength to the hair. Thyme, Tea Tree, Copabia Balm, Lemon.